Scientists have created robots of all shapes and sizes with increasing complexity in the past decades. The functions of these robots vary from carrying out industrial activities to killing cancer cells or healing wounds. 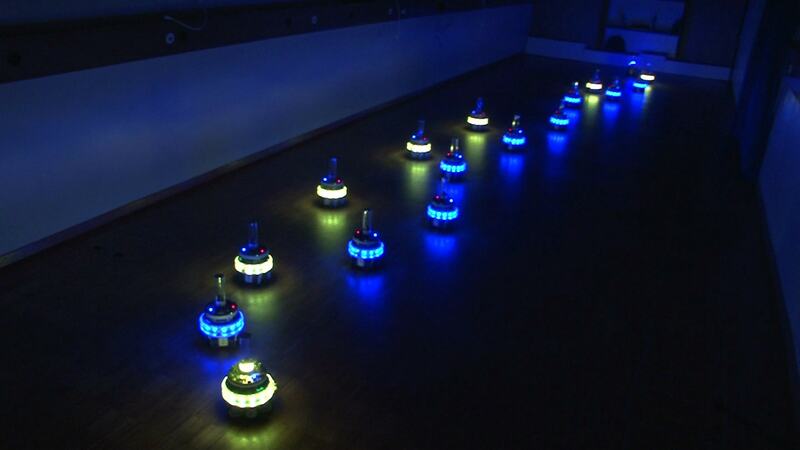 But these robots lack fine movements and energy efficiency as found in living organisms. For this, scientists had come up with a solution to integrate living cells in artificial robots to improve their performance and energy efficiency. And this is not just a theoretical concept, already a lot of scholars had started working on this at the BioRobotics Institute in Pisa. Such is the pace in which robotics industry is evolving and there is a great requirement for engineers who can work on latest robotics technologies. And the awareness to learn robotics is already viral, thanks to social media platforms and public forums. Knowing this, a lot of students wish to get started with the robotics by developing projects. But unfortunately they had to rely on some robotics kits to learn, as robotics is not actually taught in their curriculum. If you are one such student/ parent who is on the lookout for best robotics kits to get acquainted with this technology but have a lot of questions, this article is for you. How to know whether it is a good robotics kits or not? Any tips? 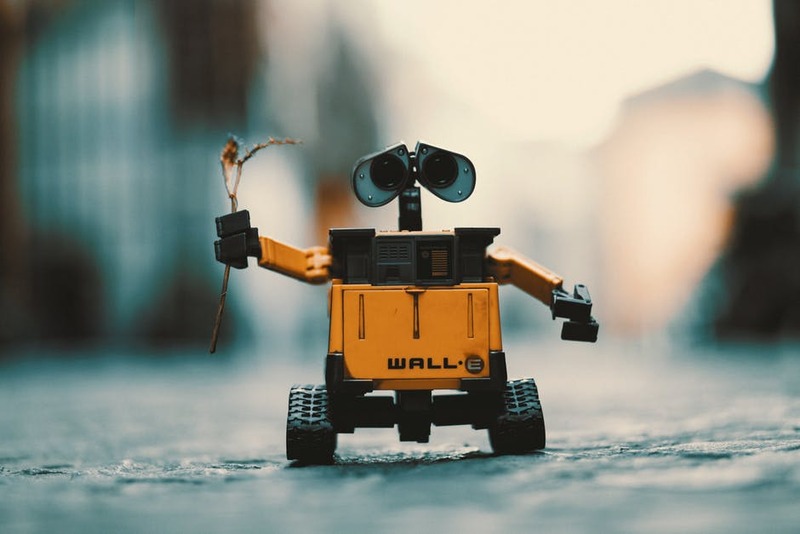 Realising the demand for robotics kits among the students, many companies have entered the market and provide low quality components with a motive to make more money. You should be very careful in choosing the company, as you will not only lose money taking such kits but also the student will also lose his/ her confidence in building robots. 1. Take robotics kits that come with course content- Taking only robotics kits will not help you learn the technology and acquire the skills. The student also needs content to learn and build the robot. 2. Prefer robotics kits that come with video based learning- As there will be complex technologies involved, it will be difficult for you to learn just by referring a manual/ booklet. And it is boring to read books & build robots. 3. Always choose the robotics kits that help you learn the technology- By just taking a DIY robotics kit and assembling it, you get a toy not any hands-on experience. So ensure there is learning in it. 4. Check whether the company provides good technical support after taking the robotics kits or not- This is extremely important as you might need help building the project. You might give up, if no one is there to help you when you are stuck. 5. Choose robotics kits that add credentials to your profile- It can be either in the form of a certification or an online authentication which can be used to showcase your skill to the world. 6. Check for the credibility of the company before buying the robotics kit- You can simply go through their social media presence or check their customer reviews to understand more about them. 7. More importantly check whether the robotics kits that you are taking have future scope or not- As continuous learning is needed to get skilled in robotics technology, ensure that the company provides you with a lot of options to upgrade after completion. You should chose a kit/ company that has a number of projects involving different technologies. This way, you can spend the next few years working with them on various kits and building good projects. Remember, this is a journey and your objective is not to build just 1-2 robots. You need to keep building and learning. We at Skyfi Labs, develop robotics kits with courses keeping the above stated points in mind. The robotics courses that we offer come with an engaging course content delivered with an innovative methodology that ensures your learning, tested genuine kits (dispatched to you in 24 Hrs. ), excellent tech support which you can schedule at your convenience and certification to showcase your skills to the world. What are the different modules I will get in a robotics kit? Any robotics project that you consider, will have 3 important parts in them. First, the microcontroller that is used as brain of the entire system which is programmable to carry out specific set of actions. Second, the sensors/ communication modules that will be used for detecting properties of surroundings or receive signals from sender. Third, the actuators like DC motors, stepper motors which makes the robot to move and make specific set of actions. I am a beginner, which are the platforms available to develop robots? One of the most integral part of a robot is the microcontroller. There are a lot of microcontrollers available in the market which are being used extensively by hobbyists, engineers and robotics enthusiasts around the world. Here are some of the platforms in which the robotics projects are built. 1. Arduino: You might have heard about this already. Arduino is an open source hardware platform that is available for everyone around the world to use and build exciting projects. It has a very simple interface which makes project building very easy on it. The commonly used Arduino boards are Arduino Uno, Arduino Mega, Arduino Nano, Lilypad Arduino etc. Recommended to: Since it uses C++ programming, it is recommended to amateurs who are beginning to build robotics projects. If you had a little bit of exposure to C programming in the past then you can easily learn to program this microcontroller. But Arduino is not only limited to small projects, the scope of it is very wide and lot of advanced robots can also be built on it with little modifications. 2. 8051, 8052 based microcontroller: It is also a widely used microcontroller to develop robotics projects. Using this microcontroller you will be able to understand the core electronics concepts in a better way. But you can’t use this microcontroller as such, you will be needing a development board to integrate it. It is similar to Arduino platform, but uses embedded C language for programming. Recommended to: Since it uses embedded C language which is similar to C programming, it is recommended to people who have some good experience on programming in the past. And also if you are an individual who likes to explore a technology from core, then this is the right platform for you. 3. 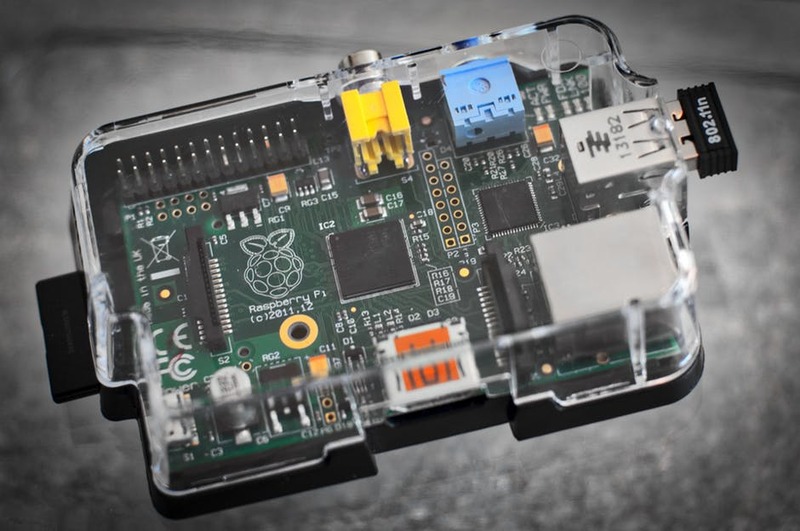 Raspberry Pi: Also known as the minicomputer, can carry out all the functionalities as that of a normal computer autonomously. It is capable of establishing a remote connection via Bluetooth, WiFi and can send the data to the cloud for remote monitoring purpose. It offers a lot of flexibility for the engineers to build innovative robotics projects. Recommended to: This platform is recommended to professionals who had already built a lot of robots and wish to develop advanced robotics projects. It uses Python programming language which will be tough for an amateur to learn & execute immediately. What are the different robotics kit available? Although there are a lot of robotics kits available in the market, it is recommended that you choose the one that suits your requirement. Also to make sure that you undergo an incremental learning curve, start building robots from basic level and move ahead to other complicated projects. 1. Autonomous Robotics Kit: If you are an amateur and have no experience of building robots, then this robotics kit is for you. It uses an Arduino as the microcontroller to control the robot’s actions. The robot that you will build using this kit can perform multiple tasks like line following, obstacle avoider/ follower, photophobic/ phototropic. 2. Sensor Guided Robotics Kit: This is one of the basic robotics project you can build using the 8051 microcontroller. By building this robot you can understand all the concepts behind the microcontroller, working of IR sensors & DC motors. You will be able to program the microcontroller to make it do multiple functions like line following, obstacle avoider/ follower and photophobic/ phototropic. 3. Mobile controlled Robotics Kit: This particular robotics kit comes with a DTMF (dual tone multiple frequency) module which can be used to control the robot that you build using your mobile phone. This robot too uses 8051 based microcontroller as its brain and you will be using embedded C language to program the bot. 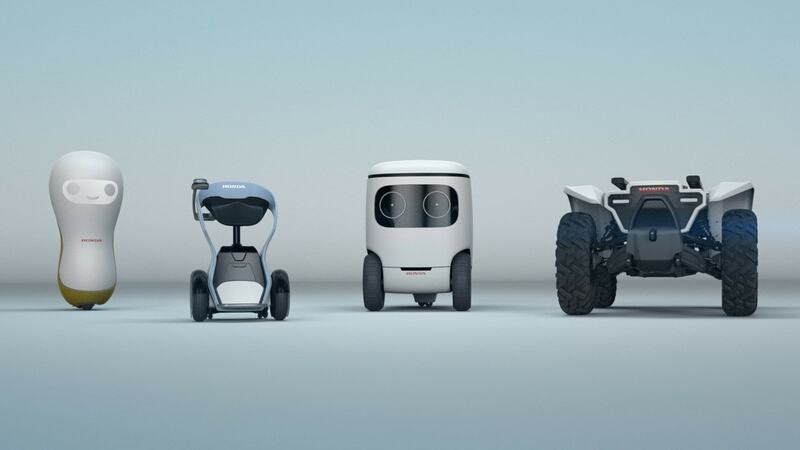 Unlike the above robots, this one will not be autonomous in its actions and so you can control it and make it move in any direction that you want it to! 1. Gesture controlled Robotics Kit: This robotics kit comes with an ADXL sensor which has multiple degrees of freedom and you will use that to control the robots movement using your hand gestures. This robot also uses 8051 based microcontroller as its brain and carryout the functions. This particular robotics kit has a lot of scope and is real time application oriented. 2. Bluetooth Robotics Kit: This robotics kit comes with a Bluetooth module which can used to establish communication between the robot and user. 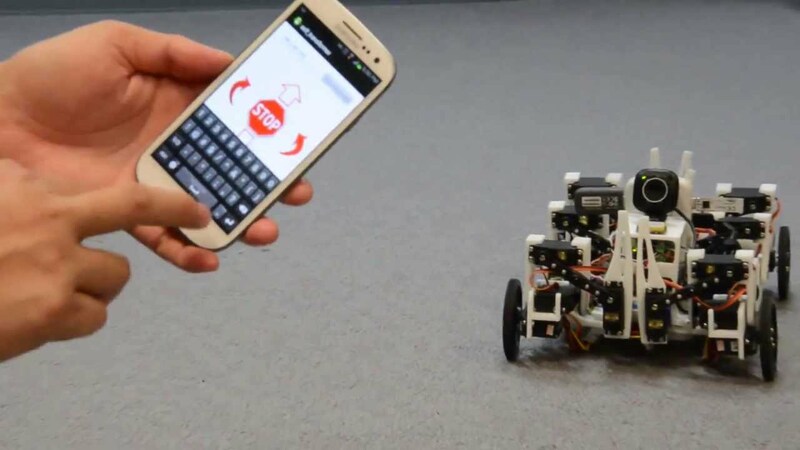 You can connect the robot to your device via Bluetooth and control its functions with an Android App. It is an excellent robotics kit to understand the wireless communication process and its integration. 3. Swarm Robotics Kit: This robotics kit comes with 2 robots to facilitate the master and slave communication. It is a very good robotics kit to make you understand the concept behind swarm technologies and it is a perfect example for semi-autonomous robot. You will use 8051 based microcontroller and Rx/Tx modules to establish the communication between the two robots. 1. Maze Solver Robotics Kit: This is one of the most widely built robot that is used in competitions to solve a maze autonomously. Since the programming is little complicated, it falls under the advanced level robotics category. 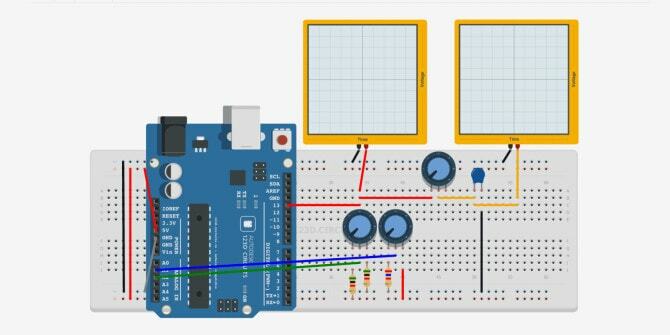 You will be using an 8051 based microcontroller and IR sensors to make it solve the given maze. 2. Voice controlled Robotics Kit: If you are fascinated about IPhone Siri or Google Assistant, then this robotics kit is for you. With this robotics kit you will be building a robot that can be controlled with your voice by integrating speech recognition technology in it. The communication between the user and the robot happens via Bluetooth. You will also be learning to build your own Android App as part of this course. 3. WiFi controlled Robotics Kit: The robot that you build using this robotics kit uses Arduino Uno and can be controlled via WiFi. The communication channel will be established between the robot and user using WiFi channel, and you can control the robot’s action through an html webpage. You will also learn the basics of html by building this robot. What if I want to learn robotics from basic to advanced level with one kit? You can take any combo course kit, with which you can build robots from basic to advanced level and have an incremental learning. 7 Robots – Combo Kit: With this robotics kit you will be able to build 7 different types of robot from basic to the advanced level. The basic level robots that you will build include the line follower, obstacle follower/ avoider, photophobic/ phototropic robot. Then you will move on to building medium level robots like mobile controlled and gesture controlled robot. And finally you will learn to build advanced robotics projects like swarm robotics and maze solver robot. It is an excellent course if you are an amateur who is looking to build exciting robotics projects and get skilled in it. Why Skyfi Labs to buy robotics kits for engineering students? 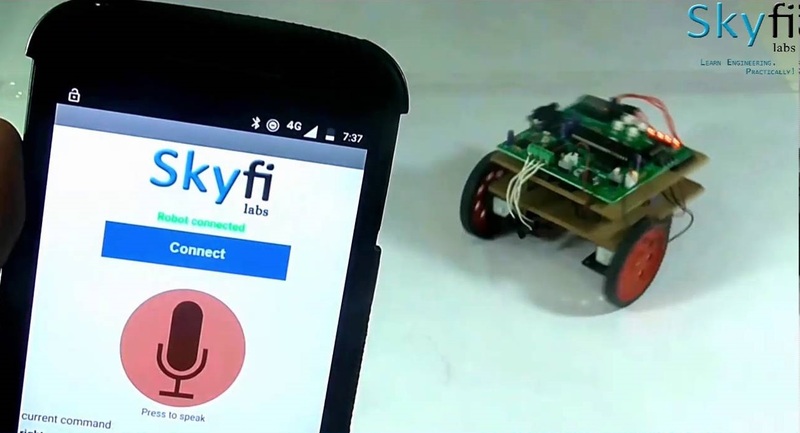 All the robotics kits that are offered by Skyfi Labs come with a course, which makes sure that the student is learning while building their robots. With the 100% tested genuine robotic kits shipped to your home, excellent video tutorials (available online 24x7) and good technical support, you can rest assure that you will build great robots and develop a very good robotics career. Do let us know what you think is the best robotics kit for engineering students by commenting below.